Adams on Criminal Law has been New Zealand's most trusted criminal law reference for over 40 years. The 2019 Student Edition looks at the Crimes Act 1961 and offers practical commentary on key sections. The concise way in which it is written, and the easy to follow format make it... read full description below. Adams on Criminal Law has been New Zealand's most trusted criminal law reference for over 40 years. 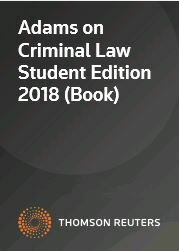 The 2019 Student Edition looks at the Crimes Act 1961 and offers practical commentary on key sections. The concise way in which it is written, and the easy to follow format make it an ideal resource for practitioners looking for a quick reference tool.